Well, let’s take a closer look at why these Facebook “Look Back” movies are taking over your news feed, why people are loving and sharing them, and how they remind marketers to leverage basic communication principles. 1. Let’s talk about me, baby. People want to see, hear, say, watch, etc., anything about themselves. 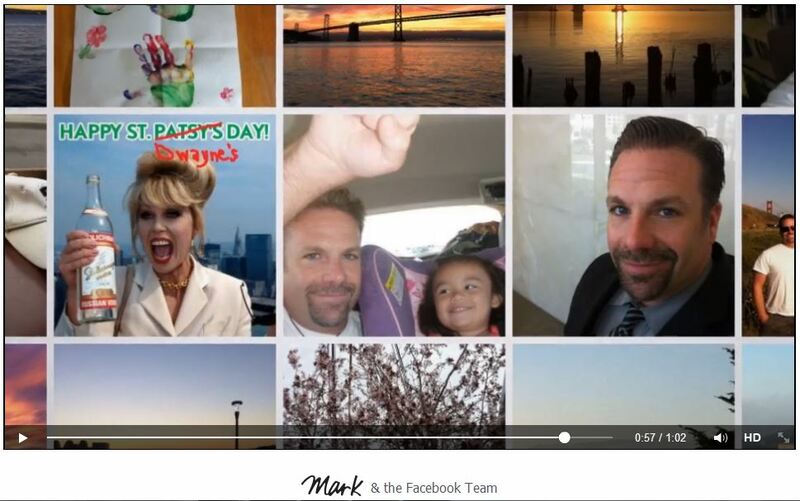 We’re inherently interested in “me.” Facebook has it easy here, because these videos are repurposed content created by users themselves, simply remixed and repackaged to great effect. So not only are you happy to watch this movie about your favorite subject — you — but you also want to watch your friends’ movies to see if you made it into theirs. 2.Elicit emotions whenever you can — and use that swell-and-compel style of music because it makes people cry like babies. Oh, sweet swell-and-compel music, why do you make me cry so? Seriously, I think I would sense profound meaning and shed a single tear even if you had me watch a video with that music played over video of a person getting ready for work in the morning. Just as long as the protagonist arrives somewhere at the end — or even if they don’t. I’m not completely sure how or why this kind of music does what it does, but I’m sure there’s some research on it out there somewhere. It certainly creates the sense that we’re on an emotional journey, that we’re creating our own story. Oh, and we’ve done it all on Facebook. 3. Use the richest form of communication available to you. Facebook is smart to repurpose our content into video, because video communicates information through both auditory and visual cues. It’s the richest form of communication after in-person interaction. The images and the music fill our senses, and watching it becomes an experience. And as mentioned above, it’s a new emotional experience about us and our personal journeys, bolstered by a surprising mix of all those emotions you felt as you posted that content the first time. 4. Make communications easy to replicate and repurpose — but personalized. It occurs to me that the Look Back movies are also like a meme. Each movie takes the same format, but the variations in content add surprise and value for the receiver. Not to mention that creating one is as easy as merging data into a document. Well … “easy” is a relative term. Talk to your technology or marketing operations team to make that happen if mail merges scare you! Also like memes, your movie is a super easy share. Simply click one button and you’re ready to post. And hey, everyone else is! I’m really happy with the CTA, as well — “Share Your Movie.” Again, the focus is on the user. Contrast with “post video” or “make our little project go viral.” And I also like that they chose to call these “Movies.” It contributes to the experience by sounding more professional, refined, and indeed more epic, than “video.” Subtle differences in words can have huge impact when you’re communicating. I’m a fan of these. I’m pretty impressed by Facebook’s Look Back movies and the response they’re getting. They’re a smart and effective tool to generate a bunch of engagement for users, leading to more eyeballs on their site for longer — one more view of the logo, one more click back over to your news feed to see another ad (! ), and one more assertion that Facebook is the place where you can share and even create your own journey. But here is a question — is Facebook thanking us with this video? Is it a gift? I notice that it’s signed “Mark & the Facebook team,” but I don’t remember a clear message from either of them, aside from “here’s your data.” I guess … you’re welcome? Nice analysis! Of course, I am not really in to them, or mine, but is that a surprise? I am so contrary. Your lessons are really well done. I agree- they could have added a thank you…but really…Face just wants us to thank them, non? Thanks for taking time to read today! Not a gift — just another way for them to add to their algorithms. I enjoyed these, too, Dwayne. One of the best lessons? They capped the videos at a minute. How many of us, in telling our own story, would have the discipline to narrow it down to a minute? Rob, hey, thanks for taking time to read today. And I LOVE your insight about the importance (and rewards!) of brevity. Stick to a small number of strategic key messages, right? If these movies were even just a bit longer, would people be as willing to watch others’ and share?